For the reviewers, here's list of games to choose from. You qualify if you've written three reviews or more. Despite what I said earlier, contestants are welcome too. Since I already own Cthulhu Saves the World and Breath of Death VII, I'll throw them in there as well. Pick one. First come, first serve. Shoot a PM or post. That was a fun competition. Kinda amazing how much was made in such a short time. Just for the record, though: Aerena is free-to-play and Saira is literally completely free with no strings attached on Steam (anyone can download it for nothing.) What are you planning to give out with those two? They're both leftover bundle keys. I don't know, really. Maybe they weren't free before? (I'm pretty sure Saira wasn't.) Anyhow, I've removed them from the list; thanks for the heads up. Awesome! I'm embarrassed to say that I forgot all about the contest until Dusk PMed me yesterday. Now I've got to go back and play everyone's games. Reading some of the comments earlier in the thread, I guess I owe everyone at least one more chapter, too. Big thanks to everyone who had a hand in organizing or judging the competition. Congratulations to everyone who submitted a game! 2nd place! Thanks to everyone who played my game, Recurrence! And thanks to everyone who participated by submitting a game, reviewing games, or contributing prizes! 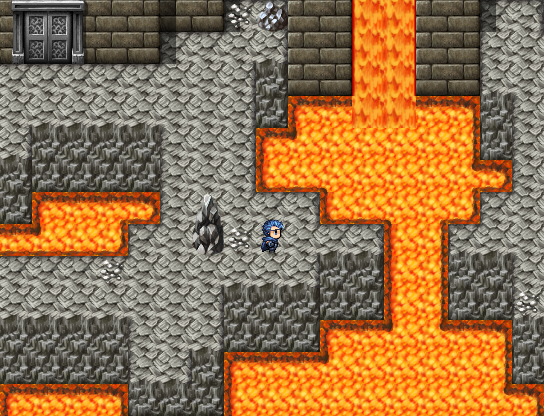 By the way, if anyone is still learning RPG Maker, I have a LOT of video tutorials, including beginner stuff. You can see the whole playlist here. Before I respond to some of the reviews, let me say a few general things: since I made the game in 30 days, I had to cut some corners and not add as much as I wanted to. It sounded like some people played version 1.0, which didn't have much music, but I updated the game a couple days later that fixed that and some other things. Sorry if you didn't get the updated version. 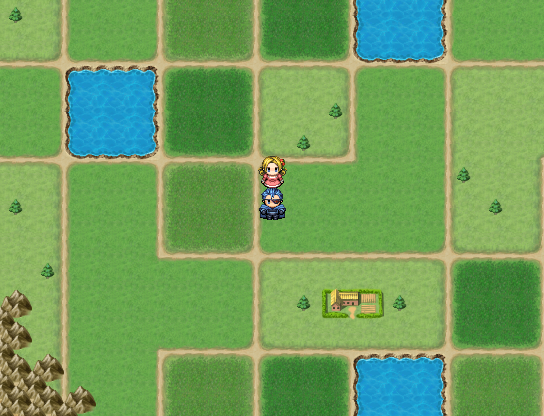 The main map is pretty bare in spots, and the story is more linear than I wanted. I had to just really focus on the main story because of the time constraint, but I intend on turning this into a full game with multiple endings and lots of sidequests and things. I also feel like the game used the time mechanics to simply set up puzzles rather than explore characters and relations. I think this is an interesting area to expand the game on, adding more characters (who aren't necesarrily part of the gameplay), and more importantly adding more information and characterisation that isn't part of the puzzles, flavor dialogue and characters to add to the world of the game. There is a bit of that with Alex (you can talk to her before you know who she is, and later there's a dialogue branch that has nothing to with any puzzles), but you're right. I would like to add a lot more of that. What is quite obvious from the very start of the game is the lack of sound. Most of the game is spent in complete silence. It sounds like you played version 1.0. The version on my site fixes all of that. There is a lot of music, and also background noise. I don't know how much of these graphics are RTP but it seems you've pulled graphics from multiple places that don't necessarily match in style. If we have a look at the teleporter pad in the beginning of the game, it feels out of place (and not because it's a freaking teleporter pad). 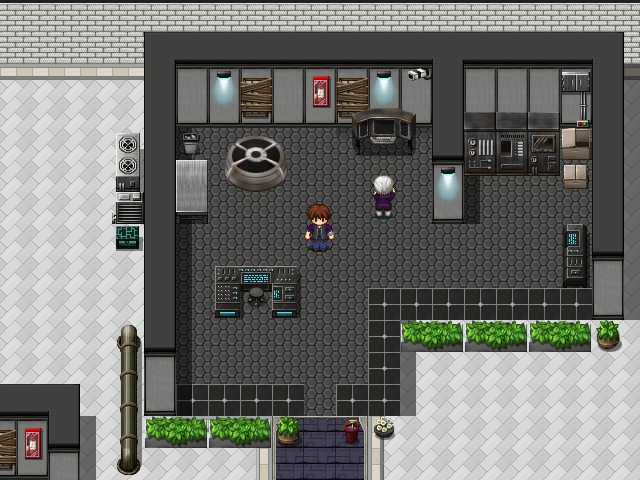 The teleporter is from the futuristic tiles, which I used a lot of, but I made it dirtier for the lab -- it *is* out of place, since he stole it from Lambent, but you still may be right. I guess you mean because it has shading on it (for the dirt), so it doesn't match the rest of the tiles? I can work on that. Another instance is the graffity to the Boundary which I assume you've drawn yourself. It has far more anti-aliasing than anything else in the game (with the possible exception of the teleporter). It doesn't look like graffiti, think of how one would actually spray that graffiti. Such large graffiti could not possibly be done in one stroke, it requires multiple strokes to get that thickness, yet your text uses single strokes. I drew a quick example next to your graffiti to illustrate using more strokes and a very limited palette (only two colors). I'm going to disagree with you here. Look at the size of the character, and the size of the beer bottles. A spraypaint can is about that size, and the paint spreads out when you spray it. I think it could definitely be that thickness on the ground. Your example looks like crayons or markers (thickness-wise). You're right that it is more anti-aliased than anything else, and I wasn't sure what the best look was. 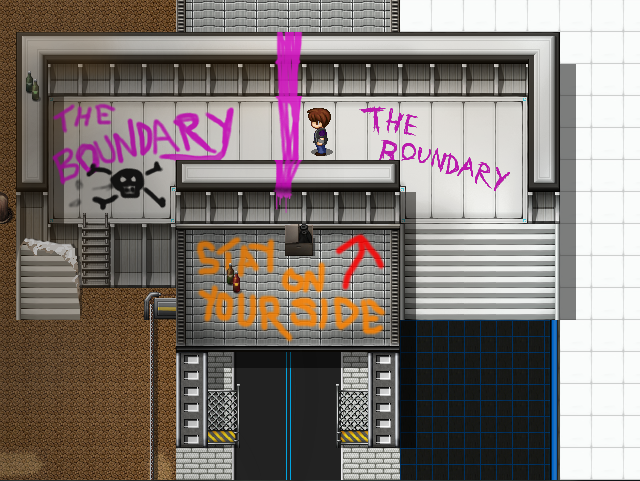 I would also advice putting the "Stay On Your Side" text where I put my graffiti. As it is now, it doesn't make much sense. You're right, although the thugs are supposed to be really stupid. I might change it later though. I like Yanfly's System Options but I'm not sure why you'd want to turn of Auto Dash since there is no negative consequences to running all the time. I used that script to *enable* autodash...are you saying I shouldn't have even left the option in there? I could remove it, but there's no negative consequence to giving the player more options that are hidden away. After I add fast-travel and more stuff, there won't be as much need to run all the time, so some people might actually prefer walking (so they don't overshoot doorways and things). That bug was fixed in a previous update, along with some other things. I haven't played MM, but I've been meaning to for years. Games that exploit this mechanic are required to either give the player a lot of hints or put a lot of characters in place that allow him to advance through different means. This game doesn't do either, meaning that the players will get stuck frequently, knowing more or less what they should do, but not how to do it. Did you call your uncle in the game? That is the primary hint system. You can ask him about lots of the information you've gathered, and he'll point you in the right direction. In some cases you can ask for another hint. It's certainly not perfect, but maybe you missed it? Reading some of the comments earlier in the thread, I guess I owe everyone at least one more chapter, too. Yes. Yes you do. A well-deserved win. If you have a site of your WIP, let us know! If not, just PM me if you have any updated versions and I'll be happy to give you testing and feedback! I had to just really focus on the main story because of the time constraint, but I intend on turning this into a full game with multiple endings and lots of sidequests and things. Definitely looking forward to that. Bookmarked your site, got overly excited thinking you're the same guy who did Super Mario Crossover before I realized that was exploding rabbit, not cracked rabbit. Thanks! It probably won't be for a while, though. I think I'm going to kickstart a *different* game first, as that probably has a better chance of success right now. Sure thing. Thanks for your kind words; I'm glad you enjoyed my little game. I don't think I need to do any more tricky scripting for the second (first?) chapter, so hopefully it won't be too long to wait. I spent a long time getting the naming and portraits to work right, and even longer on the dumb retry and game over systems. It'll be a relief to only have maps and cutscenes to work on. I did, although maybe I should have tried to insist more. It still is a great game and I'm looking forward to newer, improved versions. Congratulations on 2nd place! I'll be sending a PM to Tommy Gun shortly for the second place prize! Are people still deciding what games they want from the prize pool? I haven't heard anything since the contest ended, apart from a PM with the Chthulhu and Breath of Death Steam keys. I've been wondering that too. I got my first round of games, and sent a PM asking about the rest on 10-21, but haven't heard anything. Mixture of some people taking a bit of time to reply and some of my own busyness, the last couple weeks has been my own busyness, the person I last messaged has messaged me back so will message them back and then onto the next. A bit of a slow process, but it rolls how it goes. I might make a policy if someone doesn't reply in 3-4 days I'll move on and come back to them, informing them of course. Another, more complicated dungeon with what I generously call puzzles! Experience the epic saga all over again! Sadly, save files from 0.1 will not work properly with 0.2. Please understand. As before, you can download the game from MediaFire. 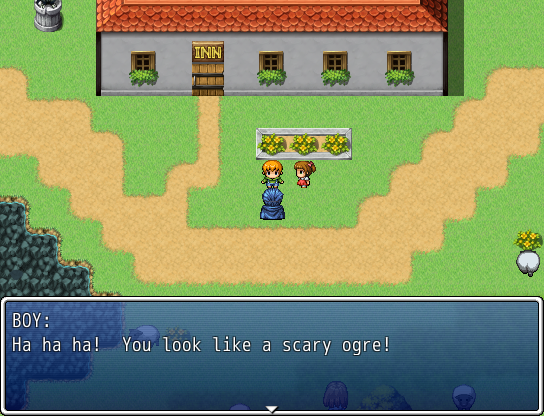 This time I put together an RTP-free package for those of you who have RPGMaker VX Ace installed already. Assuming the Steam Workshop stuff works, I will probably just post future updates (no promises) there instead of bumping this thread again. Regardless... enjoy! If you feel like it, you could make that look better by shift-click mapping the lava so you don't see the edges when it's "behind" the rocks. Since the perspective is kind-of-sort-of 3/4 view, if the character walks straight up, he shouldn't be right at the edge of the lava because he's much higher up. You probably have more important things to work on, but just thought I'd throw that out there! Neat, I didn't know about that feature. I may take another pass at it for v0.3. Thanks! Nice to see we still have a community around the competition. Sorry I didn't review the entrants in the end, it crossed over with moving house! I will get around to playing them soon though, even if the voting is over. Glad to see this still getting updated.